In small bowl, mix yogurt, mayonnaise and blue cheese until well blended. Cover and refrigerate at least 1 hour to blend flavors. Sprinkle apple slices with lemon juice to prevent browning. 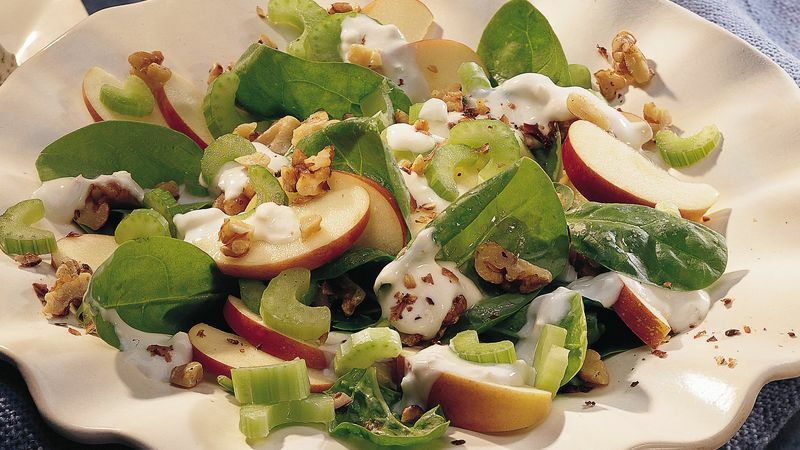 In large bowl, toss apples and spinach. Spoon blue cheese mixture over salad. Sprinkle with celery and walnuts. Although high in calories and fat, nuts provide lots of vitamin E. We need vitamin E as a protective agent against cell damage. The key is just not to go nuts with nuts! To toast nuts, cook them in an ungreased heavy skillet over medium-low heat 5 to 7 minutes, stirring frequently until browning begins, then stirring constantly until nuts are golden brown and you can smell the toasted aroma. Save time (and a dirty bowl) by using purchased reduced-calorie blue cheese dressing.